Hirochi Robaina learned about cigar tobacco at his famous grandfather’s farm. Today he is spending time outside of Cuba, including in Las Vegas. The men at the elevators at Cigar Aficionado's New York City offices last summer looked like any other group of cigarmakers—wearing guayaberas or sleek fashionable outfits and projecting an aura of the tropics. The man wearing the small fedora pulled down low and sunglasses fit right in. Perfunctory hellos were exchanged as the group entered the magazine's office on their way to a meeting. A few minutes later, an editor poked his head into my office and said, "You know, Hirochi Robaina is here." It clicked. The man in sunglasses wasn't just any cigar guy, but the grandson of the legendary Cuban tobacco grower, Alejandro Robaina—far from home and out of context. "How did you get here?" was the obvious question, so far from his normal stomping grounds in the Cuba's Vuelta Abajo. But it was even more astonishing that he was in the United States. "I got a five-year-multiple-entry visa, and I'm here for the first time," Robaina said with a big smile. Robaina inherited control of Cuchillas de Barbacoa, the wrapper farm in Cuba's prime growing region, with the passing of his grandfather Alejandro in 2010. Since then, Hirochi has overseen the family's farm in San Luis y Martínez, where the Robainas have grown tobacco since 1845. But he also has stepped into his grandfather's role as an ambassador for Cuban tobacco by traveling the world and consulting on cigar projects outside the country. For now, he is only tackling a couple of projects that appeal to him. "Oh, you would be amazed how many people are calling me, asking me to help them out," Robaina said in an interview in Las Vegas during last fall's Cigar Aficionado Big Smoke. "But I'm focused on my cigar, on my projects. I would never leave Cuba just for the money." That cigar is called HR, with the two letters on the band standing for Hirochi Robaina, and it made its public debut at the Big Smoke. Robaina has never produced a cigar for public sale before, although he has made cigars on the farm as gifts for visitors. The cigar is made with wrapper tobacco from Ecuador grown in conjunction with his Miami-based cousin, Igmar Robaina, who started the South American farm with the younger Robaina in 2010. The HR brand is being manufactured in Nicaragua by Cubanacan, a relatively new company, founded in 2006. The cigar, which comes in four sizes, is a full-bodied smoke with a deep cocoa bean note, and a layer of spiciness. The binders and fillers are Criollo '98 grown in the Estelí and Jalapa regions in Nicaragua, with a blend of four different leaves. The makers say the filler leaves have been aged two years, and the wrapper (grown in Ecuador from Habano 2000 seed) for one year. "We are not going to produce a lot of cigars," Robaina says, politely declining to give exact production figures for his brand. "But we want to focus on quality. I can't risk my family's name on a low-quality cigar." Robaina's cigar evolved out of a conversation he had with Omar González Alemán, a man who once managed the La Corona factory in Havana, and spent years as an assistant at the old Partagás factory. He was a close personal friend of Alejandro Robaina, but he left Cuba in 2004 for Costa Rica, where he owned a small factory. He ended up in Nicaragua by late 2010 where he got involved with the young entrepreneurs who had started Cubanacan. He also reached out to Hirochi in 2010, and convinced him to make a Nicaraguan cigar. During the next three years, according to Hirochi, they tested more than 50 different blends before agreeing on the final cigar. Robert Mederos, the chief operating officer of Cubanacan, says Alemán started talking about the Robaina family from the very first day he started work at the company. "The idea was awesome. But it was very complicated ...When that great news came that [Hirochi] got his visa, we went into overdrive." He says Cubanacan will continue to manufacture and distribute its other cigar brands—Cubanacan, Mederos and Soneros. "HR is a brand all by itself," Mederos says. "It is a collaboration of families in the cigar business. I've got my story. Omar has his. The Robainas have their story. And this is just a little part of their story as a family." For Hirochi, his family journey began in 1995 when his grandfather told him to go work in Havana at the Partagás factory. 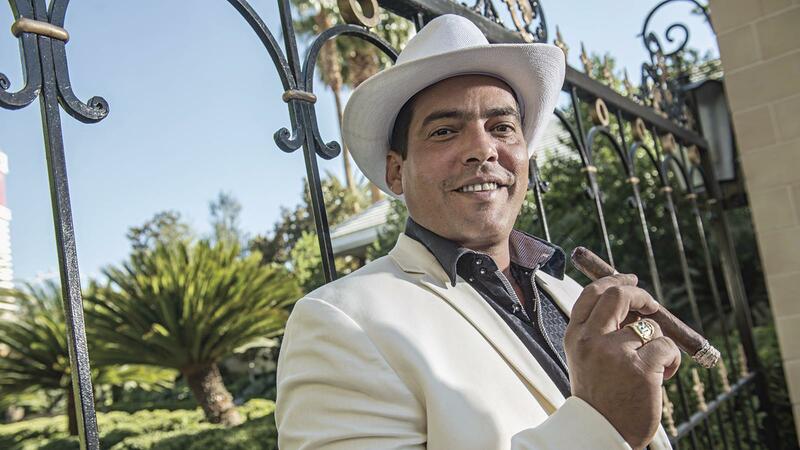 He trained as a cigar roller, and then in 1996 shifted to the H. Upmann factory, where the brand bearing his grandfather's name—Vegas Robaina—was being rolled. In 1998, Hirochi recalls, he was called to the front of the factory, and told to pack his bags because he would be joining his grandfather on a trip to Lebanon and Egypt. On that trip, his grandfather informed him that he was going to train him to take over the farm. "It was tough for me. He was my grandfather, my friend and my boss. And, he was a very tough boss," Robaina says. His first job was in the fields learning everything from the planting and care of the plants and moving on to curing and aging of tobacco. All under the tutelage of his grandfather. "A good tobacco farmer has the need to understand the whole industry," Robaina says. He adds that is why his grandfather wanted him to experience a factory, because it was a part of the industry where the older Robaina never worked. Why was Hirochi picked? "He had 11 other kids and grandkids, but he said he picked me because he saw that I was a hard worker, and that I was always fighting for a better life," Hirochi says. "A man like Alejandro Robaina comes along once every 100 years. It's not easy being the grandson of a famous man. When he died, I felt alone. It was very hard. I felt abandoned by my family. By the farm's administration. No one thought I would be able to do it. But each year that passed, I showed everyone that I could do the job. His arrival in the United States for the IPCPR convention in Las Vegas in July 2014 was, in his own words, "a dream." His visit also turned into a homecoming week for Hirochi. "I saw lots of old friends, friends of my grandfather," he says. He ran off a list of names familiar to American cigar smokers—Arsenio Ramos, Eduardo Fernandez, Litto Gomez, Jorge and José Orlando Padrón. "It's a world full of friends," he says. "The universe of tobacco is able to unify the world. Tobacco is in everything. When someone is born, we smoke. When someone dies, we smoke. When there is a wedding, we smoke. When we close a big deal, we smoke. It's capable of bringing people together," Robaina says.